I am adding pictues. On the 2nd page, (the back of the pattern cover), the first paragraph describes how to make the scissor pouch. About half way down the first paragraph on the right side is the number 4.25”, it should be 3.5”. (if it is to fit in the drawer shown on the front cover. The following sentences regarding the sewing of the wool pouch liner, at 5.25 inches wide, the side seams are 1/2 inch when sewing.”straight stitch side seams” . You can then trim them to 1/4 inch, before inserting the pouch in the the linen pocket. 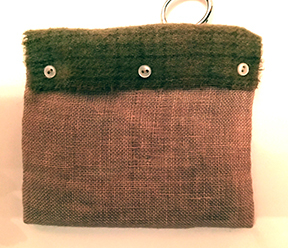 Outside of wool pocket goes to inside of linen pouch.